Paid To Click is an online business model that draws online traffic from people aiming to earn from home. Paid To Click, or simply PTC websites act as middlemen between advertisers and consumers. The advertiser pays for displaying ads on the PTC website, and a part of this payment goes to the viewer when he views the advertisement. Paid to click websites require you to click on an ad and view it for about 30 seconds to get paid. These websites let you make money without extra effort, require no skills, and are easy to sign up. All you have to do is to click a few ads on a regular basis. When your account balance reaches the minimum payout value, you can request for a payout. Payments are generally made to a PayPal or AlertPay account. Signing up and staying active in a number of these programs lets you earn steady and regular online income. This is an ideal Work At Home Job for a beginner. Paid To Click Net Jobs is a genuine resource providing assistance to people who want to earn PART TIME INCOME by viewing advertisements. Our PTC DATABASE consists of 400 PTC websites providing you a part time job opportunity. We have taken the time to check out every listed PTC website to make sure they are worth your time. Lifetime Membership Fee to join PaidToClickNetJobs.com is US $35. This is a one time fee. There are no other hidden Charges. Click "ORDER NOW" button in SIGN UP. On receipt of payment we send you user name and password to log into MEMBER area. Log in to the PTC website and start viewing advertisements. Open PTC websites regularly and view ads and start earning from this Part Time Online Job. The payment would be sent to you directly by the concerned PTC websites. The whole process of earning from paid to click jobs has been explained in 6 simple steps given below. 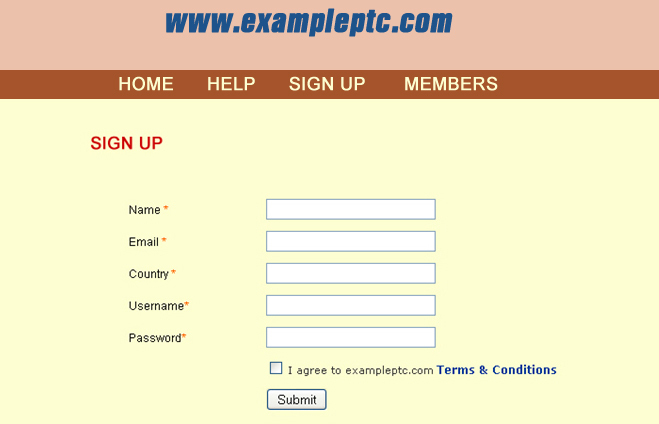 While Signing Up with PTC websites you can select a username and password of your choice to log in to the Member area. A sample SIGN UP form has been given below for reference. After signing up with a PTC website, open your Email and click on the link to confirm your sign up. 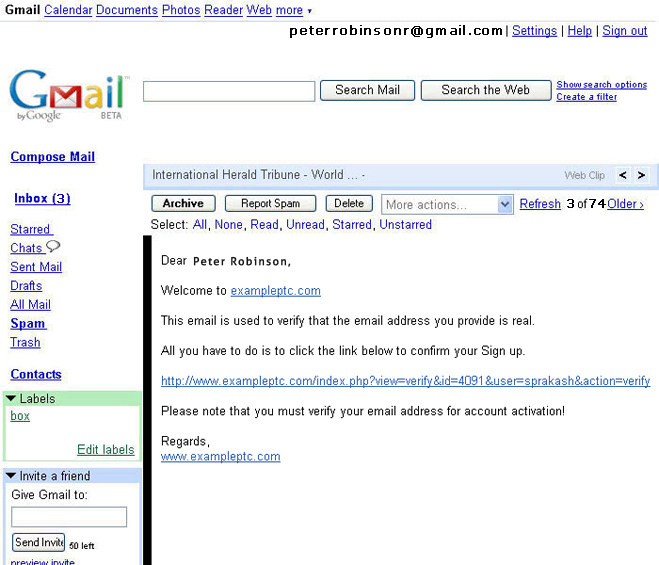 A sample confirmation Email has been given below for reference. 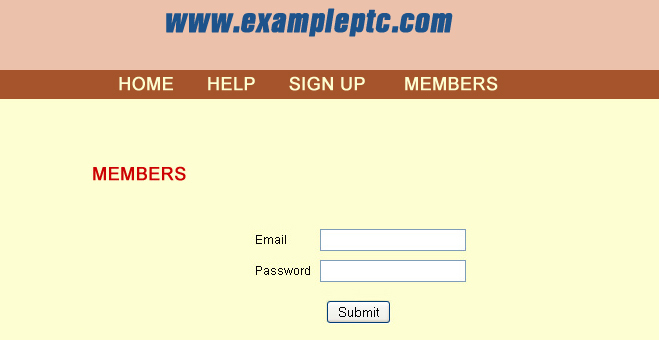 Log in to the Member area of PTC website by entering the username & password given at the time of registration. After logging in to the Member area click "VIEW ADS" tab and you can see the list of advertisments available to click. A sample VIEW ADS tab has been given below for reference. For example we have given one link below. Just click the link and see how it works. After clicking a link, the advertisement will open in a seperate window and the timer is set from 30seconds to 0(zero) seconds, once the timer reaches 0(zero) seconds your account will be be credited $0.01. You can open several PTC websites at the same time and can view the advertisements simultaneously. A sample Earnings page has been given below for reference. After viewing an advertisement you can check your earnings immediately. HOW MUCH I EARN FROM PTC PROGRAM? From the PTC database of 400 websites I am earning on an average as detailed below. My earnings per day = 400 x 10 x 0.01 = $40 per Day. Also I have just referred 2 of my friends to join PTC program. PTC websites are paying me $0.01 per advertisement viewed by my friends. My earnings per day from just 2 referrals = 400 x 10 x 0.01 x 2 = $80 per Day. Note :- This is my earning from PTC website. My experience in PTC program is 2 years. Please note that result may vary from person to person depending on individual interest. HOW I RECEIVE MY PAYMENT? PTC websites pay the earnings through PAYPAL and ALERTPAY account. From PAYPAL and ALERTPAY I receive the money by the following two methods. By Check :- I receive the payment by check at my postal address. Online Fund Transfer :- I transfer the amount in Paypal and Alertpay account to my bank account directly. Note :- Creating Paypal and Alertpay account has been explained completely in Member area. A screen shot of my Alertpay account for the Month of March 2010 has been given below. "The concept is very simple and I am working according to my convenience is the speciality of this part time job. In most of the PTC websites advertisements are readily available and one can start earning immediately after the sign up. This is a solid opportunity to work from home. It is really amazing that I am able to earn $100 to $140 per day consistently." "This is an unique opportunity for the Part Time Job seekers to earn by viewing advertisements. PTC websites are paying a reasonable amount of $0.01 per ad. I am getting 10 to 20 ads from each of the PTC website everyday. My average earning per month is $3800 just by spending 2 to 3 hours a day. Thanks to Paidtoclicknetjobs.com for providing complete information and good customer service." "I am consistently impressed with the quality and presentation of your site. This has been a fantastic resource for me. Your Membership is the most organized, complete and honest. The advice and step-by-step guides are really good. You have absolutely done your homework. It was a pleasant surprise to receive my first check in the very first month of joining." "This is a genuine work from home job specially meant for beginners. I am spending two hours a day and sitting at the comfort of my home earning $3500 every month. It is a fact that advertisements are available to view on a daily basis. My sincere thanks to Paidtoclicknetjobs.com for their support in earning from this excellent part time online job." WHY I AM PAID TO CLICK AN AD? HOW CAN I BELIEVE THIS? PTC webistes pay me a portion of their income for spending the time to go through an Advertisement. PTC websites collect amount from advertisers who are interested to advertise their products and services and share a portion of this income to the viewers. Moreover PTC websites pay a very reasonable amount of $0.01 per ad which is sustainable. Hence this job is believable and legal. To SIGN UP as a Member of PaidToCilckNetJobs.com just click "ORDER NOW" below and make payment using CREDIT CARD or PAYPAL account.